Here at Ó Crualaoí, we love good food. We pride ourselves on offering the very best of fresh, local produce that is fully traceable from farm to fork, and we love to come up with new ways for you to enjoy it with your family. If you love our local butchers and delicatessen stores, and you enjoy the recipes on our website, we know you’ll be delighted to hear that we’re now very active on Instagram! Michéal Ó Crualaoí, son of the founders of Ó Crualaoí, shares his excellent family recipes and expertise in a series of cooking videos that you can watch at home. 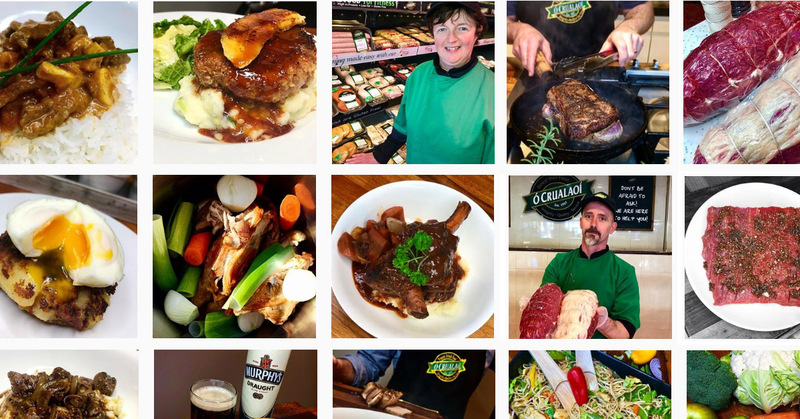 You can see these videos on Instagram at #ocrualaoifoods, and create amazing meals in your own kitchen, discovering Mícheál’s unique twist on Brisket, Roast Beef, Beef Casserole, burgers and lots more. Of course, Ó Crualaoí has a long family history of providing premium quality food and naturally delicious Irish meat. Like many families across County Cork, farming and food production have been part of the Ó Crualaoí family history and heritage for as long as records have existed. Kevin and Máire launched their first Ó Crualaoí butcher store in 1957, and have been offering the finest quality produce for more than sixty years. Ó Crualaoí has expanded to open several stores in Co. Cork, and has remained a family business that values integrity and service above all else. If you like to try new recipes, or want a bit of inspiration, you’ll find Michéal’s videos a fantastic resource. His passionate commitment to great food is presented with natural humour and makes for a really enjoyable watch while you’re learning new recipes, too. You can enjoy Michéal’s cooking videos from your mobile. Check out videos in Highlights for Fillet Steak, Lamb Chump, Meat Crush Monday (#MCM), topside beef and more, and you can even watch the entertaining outtakes too! Watch in advance to inspire your meal planning and shopping lists, or prepare everything you need and watch Michéal as you cook to make the most of his top tips. Each video takes you from selecting your meat to serving up your finished meal, and we know your family will be delighted with the results! Whether you’re new to home cooking or have been looking out for great new recipes to try, we know you’ll be as impressed by these ideas as you are by the delicious Ó Crualaoí produce that inspires them. We believe that you and your family really will taste the difference. • Beef Casserole. Beef stew or casserole is a wonderfully hearty dish, featuring local stout as well as our delicious local beef. This is a great dish for any family occasion, especially for warming up on a cold day, and Michéal makes the whole process look easy in this great cooking video. • Pork Chops in Apple Cider. In this video, Michéal takes you through every step of cooking the perfect pork chops, from butcher’s counter to seasoning and cooking, and even demonstrates the best way to present and serve your meal. • Burgers. Have you always wondered how to get your burgers cooked to perfection, just like the top restaurants do? Michéal talks you through the process in his cooking video on burgers, so you can get it right every time. Check out all of his top tips and tricks to make sure you can serve your meat at its best, and make the most of food your family will love. • Lamb Shank. If lamb is your favourite meat, lamb shanks in the slow cooker will be a popular recipe in your household. An ideal dish for Easter and Springtime, we recommend Michéal’s recipe to ensure you get the best of your delicious, seasonal meat. As mentioned in the video, our butchers will always be happy to offer you the very best cuts of meat for the dish you are planning to serve. • Steak. There isn’t much to beat a steak dinner, and Michéal’s recipe is second to none. He will guide you through choosing a top quality fillet steak or the correct weight of steak to serve your family, and then show you exactly how to cook this special meal just the way you like it. You’ll discover how to cook all of the beautiful side dishes that will set your meat off to perfection, so you can impress the family when you serve up a dinner that’s extra special. • Meat Crush Monday (#MCM). If you’ve never heard of Meat Crush Monday (#MGM), you’ll love the way that Michéal transforms classic recipes with a modern twist. With such recipe ideas as Beef Brisket updated for the whole family, this is an extra special way to enjoy your Ó Crualaoí meat and introduce your family to some really great tasting food. Instagram and cooking videos are a totally modern phenomenon, stepping into the role that was previously filled by cookery books and cookery programmes on the television, and if you haven’t tried them yet, we’d encourage you to give it a go. Just a few months ago, Michéal was not familiar with Instagram himself, but he soon got into the swing of presenting his cooking videos, and is a great sport, working hard to demonstrate his love of great food and share his cooking with the world. Check out his latest videos and let us know whether they’ve encouraged your family to try new things – we think Michéal is a born presenter! Whether you’re new to Instagram, like Michéal, or an experienced social media user, you’ll soon discover your favourites and this can be helpful in your daily life. We hope that our cooking videos will be useful tools for our customers and others who love cooking, and we look forward to sharing new recipes and ideas with you. Our aim is to help make great food more accessible, especially for busy, growing families, and we’d love to hear from you if you’ve found our videos useful. So remember to Follow us on Instagram to make sure you don’t miss our videos and step by step instructions on how to create family meals that you’ll love. We have a great range of videos to suit all tastes and incorporate a diverse choice of meat, and there are plenty more excellent cooking videos on the way. Don’t forget that you can pop in to your local Ó Crualaoí store at any time and talk to our experienced butchers about the best options for your family, and we will always be happy to share our top tips and recommendations. We have stores in Wilton, Ballincolllig or Fermoy, or you can order online at any time and we will deliver your top quality, local meat to your door.